Call 252-512-0471 to schedule your first appointment. At Miracle-Ear®, we understand the need for quality hearing aids in Kinston, NC, so we're happy to offer hearing solutions that can improve your quality of life. Our center proudly offers a wide selection of hearing aids made to enhance your life. As an independently owned and operated location, our center is home to compassionate hearing care specialists who know the industry well and will help you find the right solution for your particular needs. Our hearing aids utilize industry-leading advancements, including our newest GENIUS™ Technology. GENIUS™ Technology affords you the opportunity to move about different acoustic settings with ease. You'll be thrilled to know our hearing aid center offers a 30-day trial,* so you have the chance to try out our hearing aids prior to making the final commitment. Our brand is known all over the country, as we have 1300 locations nationwide. With that in mind, you can rest easy knowing that we offer service you can count on. Whether you're looking for hearing aids that work great without irritating feedback or a hearing aid you can manage using your smartphone, Miracle-Ear is at your service. Our hearing solutions can offer an array of benefits, including improving your speech recognition along with your ability to hear the radio or TV more clearly. From free hearing tests** to hearing aid repairs, we offer a variety of valuable services. Visit our location in Kinston today for additional information. 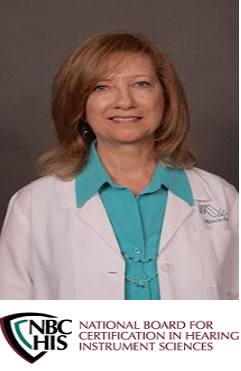 Charlene Doss is a licensed Hearing Aid Specialist and she is also Board Certified in Hearing Instrument Sciences. She's worked at Miracle Ear since 2005. Charlene loves her career with Miracle Ear, and it shows in the attention and care that she gives to each of her patients. "I love being a Hearing Specialist. It is a great way to help change people's lives. I think the general public thinks that someone with hearing loss simply needs to put on a hearing aid and their problem is solved. There is so much more to fitting hearing aids and retraining the brain to receive sounds. I don't sell hearing aids. I provide enough information for my patients to be able to make a good decision and choose the right hearing aids. I am their guide." Charlene and her family moved to North Carolina 26 years ago. Her husband Steve retired from Seymour Johnson AFB in 1995. Her 3 children are now grown and she has been blessed with 3 grandchildren. "Over these years I have learned so much and my experience has allowed me to better serve my new patients and continue to help my current and longtime patients."